In returning to this site near La Palmyre, we were hoping to repeat our experience of two years ago. On that occasion, about the same week of the year, we had heard the haunting, night time call of recently fledged Long-eared Owl chicks. [We were lucky to have identified them through sound alone, being dark!] This strategy seemed like setting ourselves up for disappointment but all was well; at about 10:30 PM a Long-eared Owl chick dutifully began its call in the area around our pitch and we listened, mesmerized, until it departed, presumably on its overnight feeding expedition. Eventually we slept and set about our first full day here. Francine, my navigation officer, had noticed an interesting-looking VTT cycle route. I’ve never been keen on our term “mountain bike”; the very last thing I’m likely to do is cycle any form of bike up a mountain. I much prefer the French term “velo tout terrain (VTT)”, an all-terrain bike; it sounds a generally much more applicable term to my way of thinking. Anyway, we set off on a very varied 23 mile VTT route. 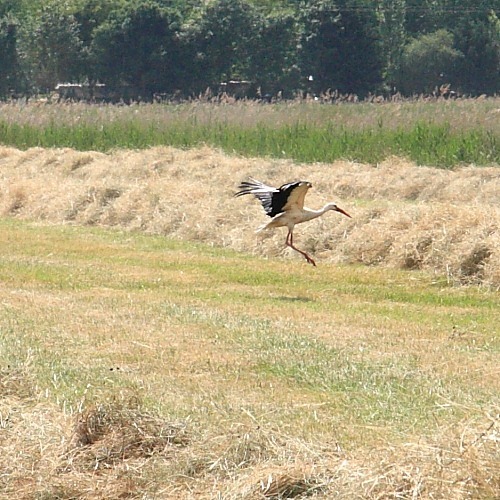 The route began by crossing a marsh area where we came across a farmer turning hay in a field. Whirling above the field, waiting for critters to be disturbed (or chopped up?) 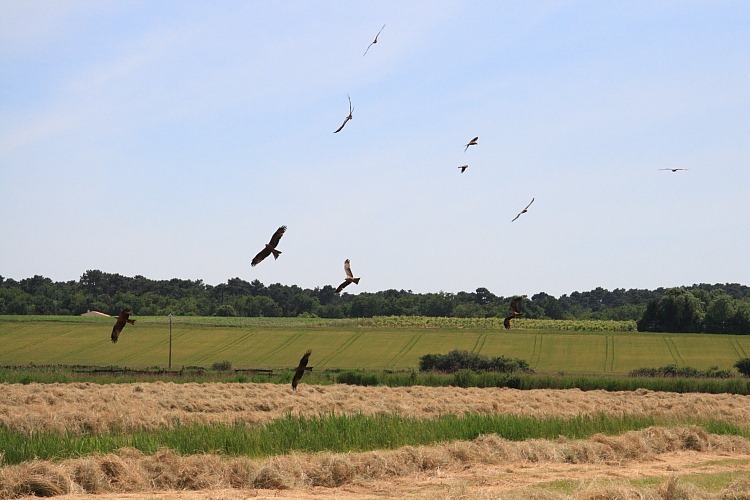 by the tractor were no less than 14 black kites. Above them occasionally were four buzzards and, strutting their stuff on the ground, four Storks, all looking for a meal of unfortunate furry creature. The kites’ aerial acrobatics, now and then swooping for and squabbling over the odd morsel or two, was an impressive site. We’ve never before been so close to so many majestic raptors, though, doubtless, this is not the furry critters viewpoint. The farmer had clearly seen it all before and carried on unemotionally turning his hay. 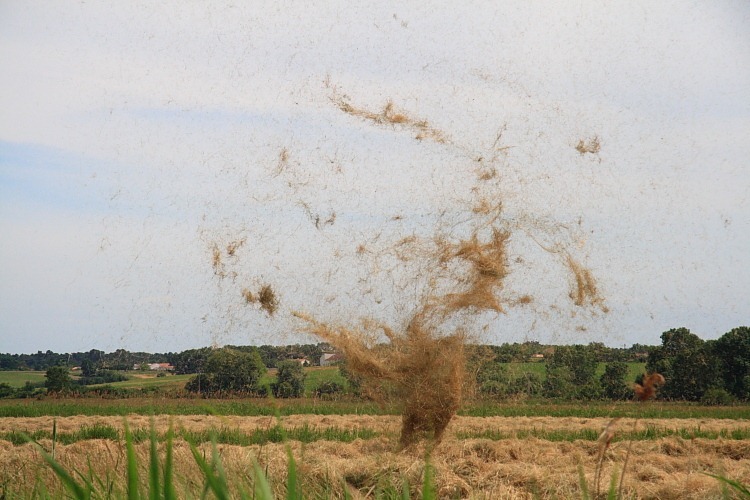 It was a generally calm day but, as we were watching the kite flying display, a whirlwind formed and began whipping up the initially neat rows of hay into small tornados, turning it once again rather more randomly whether the farmer wanted it or not. I could just imagine him putting his head in his hands in despair. I’m sure he took it in his stride, though. You can’t time shots like this so thank technology for machine-gun cameras. Francine successfully re-used several million pixels capturing this unexpected display of nature. Some of the VTT route was softish sand – our legs ache a tad.